To roast the garlic, use a whole bulb and slice off the very tops of the cloves. Coat with one teaspoon olive oil, wrap in foil and roast for 30 minutes at 400°F. 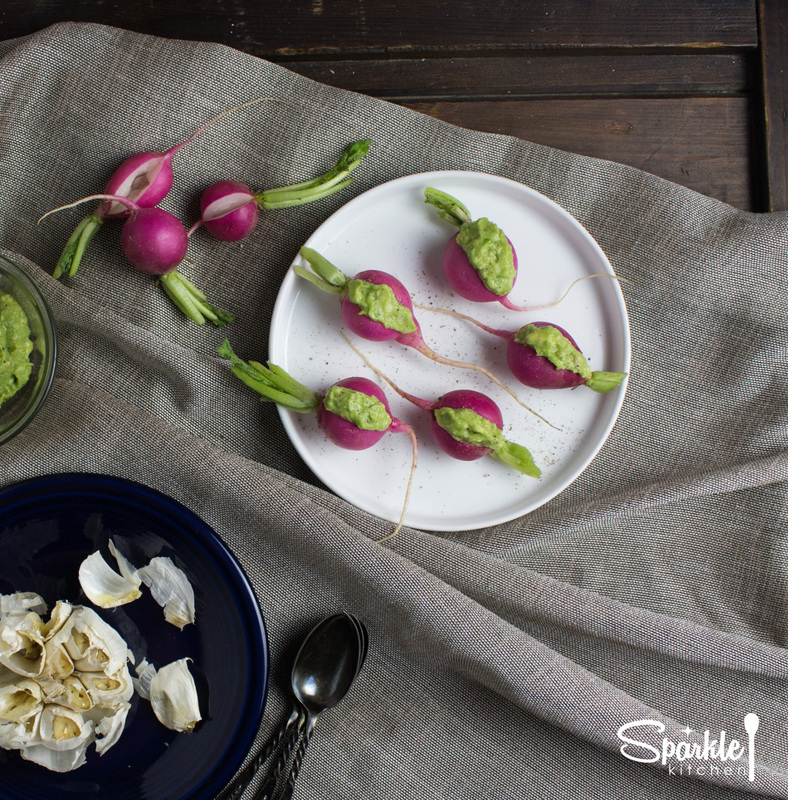 In a bowl, mash the avocado and garlic together with a fork until well incorporated. Stir in the salt. Set aside. 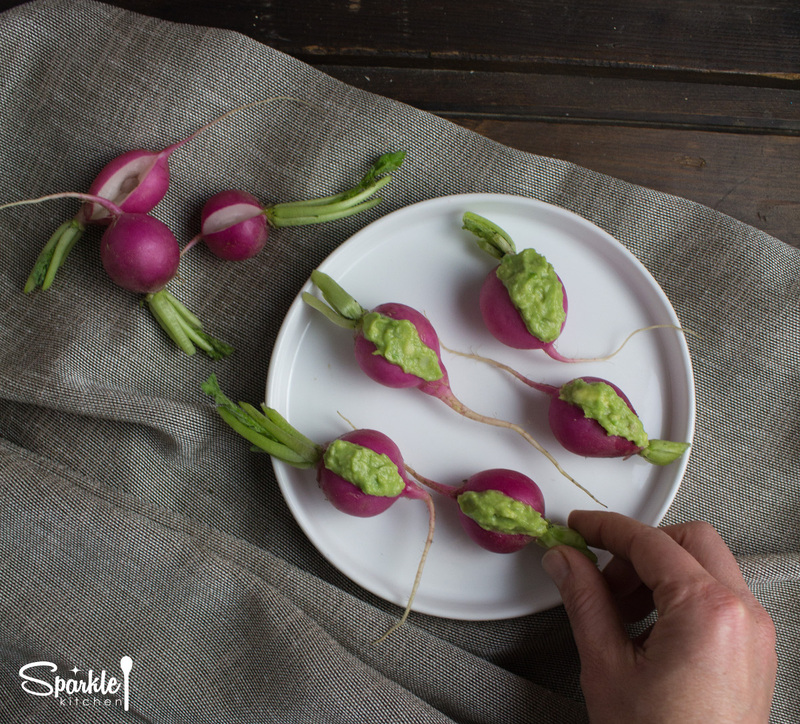 Slice small slits into each radish. Use a paring knife to hollow out each one to make more room for the spread. 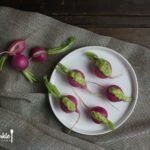 Stuff each radish with the avocado garlic spread. Sprinkle black pepper on top. 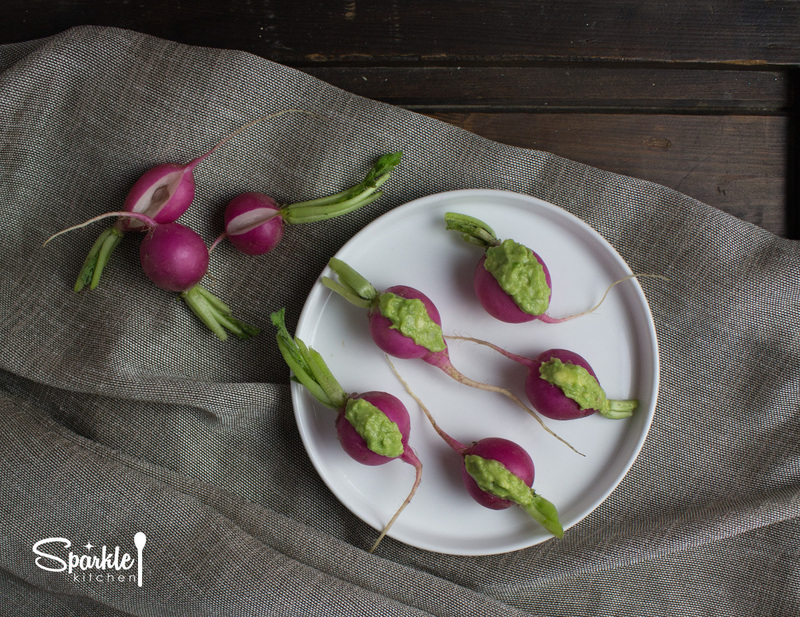 Fresh radishes stuffed with roasted garlic avocado spread and freshly cracked black pepper. Last weekend, I made a huge batch of my sweet potato dark chocolate mousse to feed a hungry crowd. All the skins had to be removed to achieve the right consistency and since I’m someone who can’t stand the thought of throwing away nutritious food, I saved all of them. The potato skins filled my already too-full refrigerator. I had to think of a creative recipe quick. And then it occurred to me. 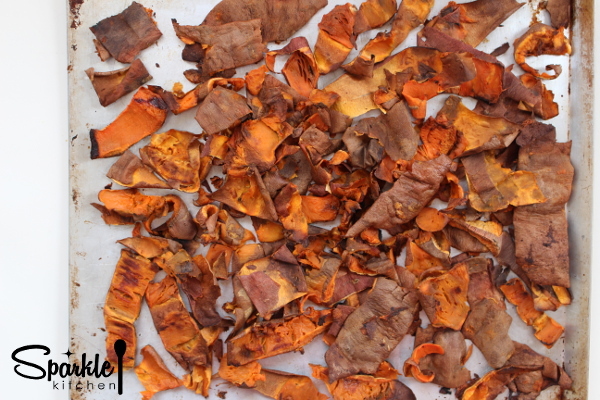 I could turn all those lovely peelings into chips! I honestly do not remember the last time I had nachos. They’re always covered in cheese, which I can’t eat and let’s face it, the cheese is the best part. 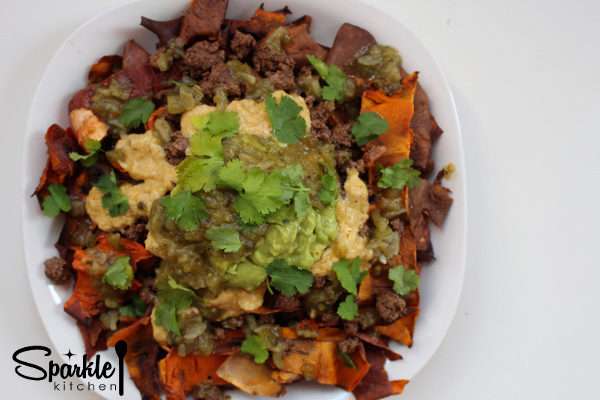 Recently I found a dairy-free cheese dip recipe begging to be made and I thought no better way to enjoy chips than as nachos. The dairy-free cheddar cheese dip was created by Jane of Jane’s Healthy Kitchen and it’s the best dairy-free, nut-free cheese I’ve ever made. Non-dairy cheese is all about the consistency and she nailed. 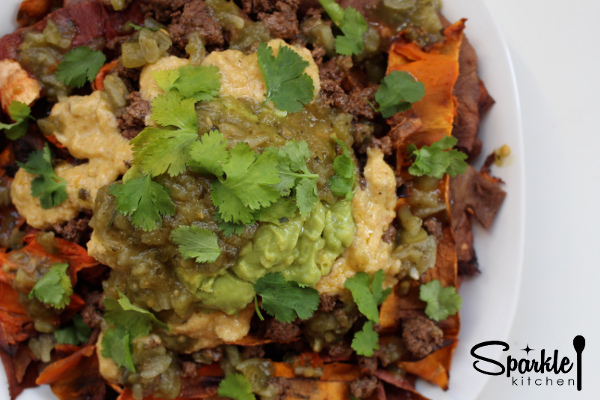 Once the chips are baked, you can layer any of your favorite toppings on these. Get creative and have fun with it! 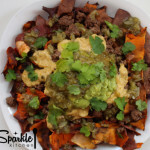 Baked sweet potato skins as a chip alternative for nachos. 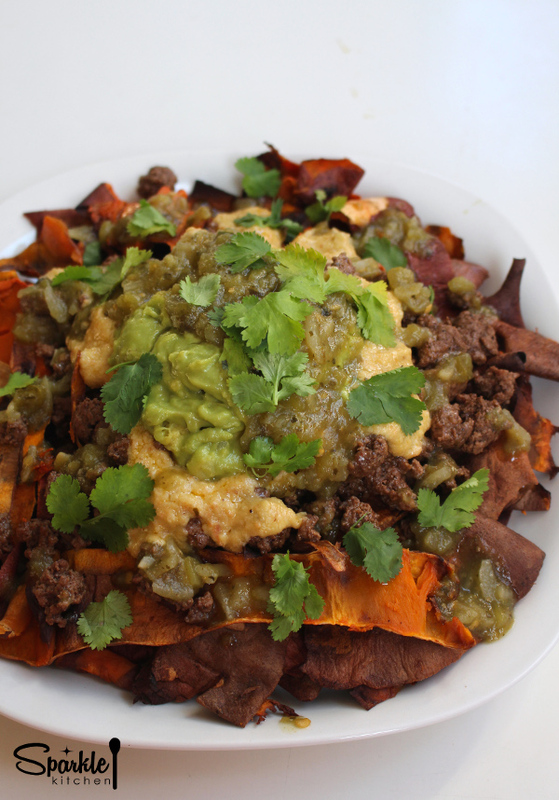 For the Sweet Potato Chips, preheat oven to 425 degrees. Carefully peel potato skins lengthwise from top to bottom so that you create long strips. Coat two large roasting pans with coconut oil. Lightly salt the potato skins before placing in the oven. Roast for 20-30 minutes, watching carefully to make sure they do not burn. You may need to flip them or rotate the pan a few times dependent upon the hot spots in your oven. Cool for 5 minutes on roasting pan. For the ground beef, mix in seasoning mixture and then crumble into a skillet over medium-high heat. Cook 3-5 minutes until evenly browned. 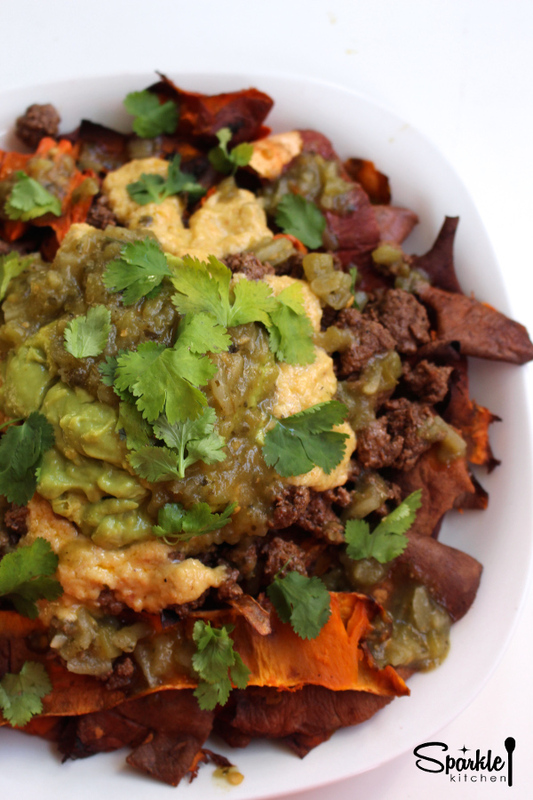 Transfer sweet potato chips to a large plate and layer on the ground beef, cheese, guacamole, salsa and cilantro.